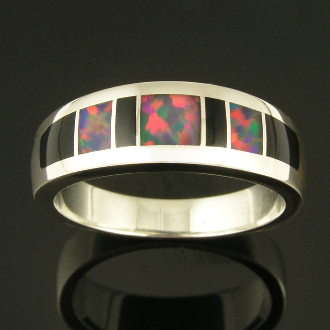 Woman's sterling silver ring inlaid with lab created opal and black onyx. The 3 pieces of multi-color created opal are a striking contrast to the 4 pieces of black onyx surrounding them. You will be mesmerized watching the opal colors shift as you roll the ring from side to side. The band measures 6.5mm wide and is shown in a size 6 1/4 for scale. The ring will be made to order in your ring size in 2 to 4 weeks. This artisan handcrafted ring would make a great alternative wedding band for someone looking for a unique handmade wedding ring.